Stratego is a strategy board game for two players on a board of 10x10 squares. Each player controls 40 pieces representing individual soldier ranks in an army. The objective of the game is to find and capture the opponent's Flag, or to capture so many enemy pieces that the opponent cannot make any further moves. Players cannot see the ranks of one another's pieces, so disinformation and discovery are important facets to gameplay. The object of the game is to capture the opponent's flag or cause a surrender. Typically, one player uses red pieces, and the other uses blue pieces. The ranks are printed on one side only and placed so that the players cannot identify the opponent's pieces. Each player moves one piece per turn, when the player wants to attack they move their piece onto a square occupied by an opposing piece, both players reveal their piece's rank; the weaker piece (there are exceptions; see below) is removed from the board. If the engaging pieces are of equal rank, both are removed. A piece may not move onto a square already occupied unless it attacks. Two zones in the middle of the board, each 2x2, cannot be entered by either player's pieces at any time. They are shown as lakes on the battlefield and serve as choke points to make frontal assaults less direct. In the event that a player has no movable pieces, the opponent is the winner. The average game has 381 moves, The number of legal positions is 10115, The number of possible games is 10535. Players arrange their 40 pieces in a 4x10 configuration at either end of the board. Such pre-play distinguishes the fundamental strategy of particular players, and influences the outcome of the game. For most pieces, rank alone determines the outcome, but there are special pieces. The most numerous special piece is the Bomb (each player has six; note that the Bombs cannot move) which only Miners can defuse. It immediately eliminates any other piece striking it, without itself being destroyed. Each player also has one Spy, which succeeds only if it attacks the Marshal, or the Flag. If the Spy attacks any other piece, or is attacked by any piece (including the Marshal), the Spy is defeated. Each player has six Bombs and one Flag. The Flag and Bombs are the only pieces that cannot attack another piece due to being unable to move. The Bombs remain on the board, unless removed by a Miner. All movable pieces, with the exception of the Scout, may move only one step to any adjacent space vertically or horizontally. The Scout may move any number of spaces in a straight line (such as the rook in chess). In older versions of Stratego the Scout could attack only if it began its turn adjacent to an enemy piece. 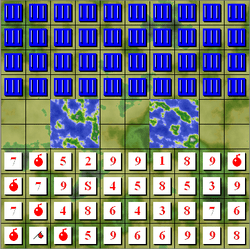 In more recent versions of the game the Scout can move several squares, ending with attacking an enemy piece. No piece can move diagonally, or back and forth between the same two spaces for more than three consecutive turns. Some versions (primarily those released since 2000) make 10 (the Marshal) the highest rank, while others (versions prior to 2000, as well as the Nostalgia version released in 2002) have the Marshal piece ranked at 1. In contrast to chess, Stratego is a game with incomplete information. In this respect it resembles somewhat such chess variants as Kriegspiel or Dark chess. Collecting the information, planning, and strategic thinking play an important role in Stratego. Psychological aspects are very important too. Placing the Spy too far forward, for example, makes it more likely to be captured early on, but placing it too far back may make it inaccessible when the enemy Marshal is identified. Likewise, Miners are weak, but their ability to defuse Bombs may be needed early (although some players prefer to leave Bombs "unexploded" as long as possible, particularly if they hamper an opponent's movements). The placement of "reserve troops" in the rearmost row and deployment of Scouts, which can move in an unimpeded straight line, is also a strategic point. During game play, players must identify Bombs without sacrificing too many troops, determine the probable location of the enemy Flag, and form an attack plan that takes into account the likely ranks of the troops and exact location of the Bombs that usually surround the Flag. Since one of the win criteria is to capture the Flag, its placement is vital. It is commonly placed on the back row surrounded by two or three Bombs for protection. Some players will use this generalisation to their advantage and place the Flag somewhere unprotected, for example the Shoreline Bluff (also called "the Lakeside Bluff"), i.e. placing the Flag directly adjacent to one of the lakes where the opponent may not think to look for it. The flag in a Stratego game, protected by a bomb. Inexperienced players may accidentally alert an opponent to the location of their Flag by calling too much attention to it when they initially position their pieces on the board. This is often done by simply placing their Flag down first and then constructing their defenses around it. One counter measure for this is to place all the pieces on the board randomly and then rearrange them into the desired setup. This tactic became obsolete when some newer versions came supplied with a cardboard privacy screen. A player could threaten a known high-ranking piece (such as the Colonel) with an unrevealed low-ranking piece (perhaps a Sergeant) to convince the opponent to retreat. A player might charge with a Miner toward a known higher-ranked piece, with the view to attack a bomb. A cluster of Bombs set by itself may deceive one's opponent into thinking that the Flag is there when, in fact, it is several spaces away. If a Marshal wins a battle (and is thus revealed), and the opponent immediately moves a piece near his or her back row, the player with the just-revealed Marshal may assume that this piece is the Spy when, in fact, the Spy may be several spaces away (and already close to the Marshal.) This is a common tactic as it may cause the Marshal to move next to the Spy, allowing the Spy to attack first. Scouts are very useful towards the end of the game, once the board is more clear. They can be used to identify bombs on the back row, reveal bluffs, or even capture the flag. Scouts are most effective when they are moved one space at a time until necessary, as the moment they move multiple spaces, they are identified as a scout. Since they can move along a whole line, they are also effective for catching a spy daring to move into hostile territory, even when across the gameboard. The scout can also be cleverly used to covertly attack the spy once its location has become somewhat obvious. In most games, it is advisable to have the Spy shadow a General or a Colonel. These pieces are normally vulnerable to attack by the opposing Marshal. Keeping a General or Colonel in the same vicinity as the spy allows an effective retreat to where the opponent's Marshal can be ambushed by the Spy. Spy bluffs are also effective. For example, using a Sergeant to shadow a Colonel might confuse an opponent, who might be reluctant to have their Marshal attack the Colonel. Sophisticated players might identify opposing Bombs, but leave them in place, interfering with the enemy's movement. To do this, it is vital to memorize the location of all the opponent's Bombs as they are identified. By keeping the Miners unmoved in their territory during the early game, a player can create the Bomb bluff, in which the opposing player may mistake those unmoved Miners for Bombs. One of the most important concepts of Stratego is the incomplete knowledge and misdirection, so the manual recommends taking a piece with one that is not much stronger than it, for example take a Captain with a Major. In the same manner, one strategy is to protect with an "evens and odds" system, where a piece is protected by one two levels stronger than it, an odd piece protecting another odd piece, for example protecting the Captain with a Colonel. If a player has gained an advantage over the opponent, the advantage can be protected by attacking pieces of equal rank and canceling them out, such as attacking a Major with another Major. This would be a significant loss for an opponent lacking a Colonel, General, or Marshal, and leave your highest ranking piece all the more powerful. A risky strategy, which might be necessary when losing, is to attack unknown, unmoved pieces with a strong piece. This strategy relies on odds, for example if a player attacks an unknown, unmoved piece with a General, it would lose to the Marshal, a Bomb, or the other General. The odds are 7 in 40 of losing the General, but the odds can be improved by not attacking pieces likely to be Bombs, or by keeping track of the pieces already identified. The origins of Stratego can be traced back to traditional Chinese board game "Jungle" also known as "Game of the Fighting Animals" (Dou Shou Qi) or "Animal Chess". The game Jungle also has pieces (but of animals rather than soldiers) with different ranks and pieces with higher rank capture the pieces with lower rank. The board, with two lakes in the middle, is also remarkably similar to that in Stratego. The major differences between the two games is that in Jungle, the pieces are not hidden from the opponent, and the initial setup is fixed. A modern, more elaborate, Chinese game known as Land Battle Chess (Lu Zhan Qi) or Army Chess (Lu Zhan Jun Qi) is a descendant of Jungle, and a cousin of Stratego: the initial setup is not fixed, both players keep their pieces hidden from their opponent, and the objective is to capture the enemy's flag. Lu Zhan Jun Qi's basic gameplay is similar, though differences include "missile" pieces and a Chinese Chess-style board layout with the addition of railroads and defensive "camps". A third player is also typically used as a neutral referee to decide battles between pieces without revealing their identities. An expanded version of the Land Battle Chess game also exists, adding naval and aircraft pieces and is known as Sea-Land-Air Battle Chess (Hai Lu Kong Zhan Qi). It was in fact designed by a lady, Mademoiselle Hermance Edan, who filed a patent for a 'jeu de bataille avec pièces mobiles sur damier' (a battle game with mobile pieces on a gameboard) on 1908-11-26. The patent was released by the French Patent Office in 1909 (patent #396.795 ). Hermance Edan had given no name to her game but a French manufacturer named "Au Jeu Retrouvé" was selling the game as L'Attaque as early as 1910. Depaulis further notes that the 1910 version divided the armies into red and blue colors. The rules of L'attaque were basically the same as the game we know as Stratego. It featured standing cardboard rectangular pieces, color printed with soldiers who wore contemporary (to 1900) uniforms, not Napoleonic uniforms. The modern game of Stratego, with its Napoleonic imagery, was originally manufactured in the Netherlands by Jumbo. Pieces were originally made of printed cardboard. After World War II, painted wood pieces became standard. The game was licensed by the Milton Bradley Company for American distribution, and introduced in the United States in 1961 (although it was trademarked in 1960). Starting in the late 1960s all versions switched to plastic pieces. The change from wood to plastic was made for economical reasons, as was the case with many products during that period, but with Stratego the change also served a structural function: Unlike the wooden pieces, the plastic pieces were designed with a small base. The wooden pieces had none, often resulting in pieces tipping over. This, of course, was disastrous for that player, since it often immediately revealed the piece's rank, as well as unleashing a literal domino effect by having a falling piece knock over other pieces. European versions introduced cylindrical castle-shaped pieces that proved to be popular. American variants later introduced new rectangular pieces with a more stable base and colorful stickers, not images directly imprinted on the plastic. The game is particularly popular in the Netherlands, Germany, and Belgium, where regular world and national championships are organized. The international Stratego scene has, more recently, been dominated by players from the Netherlands. European versions of the game give the Marshal the highest number (10), while the initial American versions give the Marshal the lowest number (1) to show the highest value (i.e. it is the #1 or most powerful tile). More recent American versions of the game, which adopted the European system, caused considerable complaint among American players who grew up in the 1960s and 1970s. This may have been a factor in the release of a Nostalgic edition, in a wooden box, reproducing the Classic edition of the early 1970s. The Jumbo Company continues to release European editions, including a three- and four-player version, and a new Cannon piece (which jumps two squares to capture any piece, but loses to any attack against it). It also included some alternate rules such as Barrage (a quicker two-player game with fewer pieces) and Reserves (reinforcements in the three- and four-player games). The four-player version appeared in America in the 1990s. Electronic Stratego was introduced by Milton Bradley in 1982. It has features that make many aspects of the game strikingly different from those of classic Stratego. Each type of playing piece in Electronic Stratego has a unique series of bumps on its bottom that are read by the game's battery-operated touch-sensitive "board". When attacking another piece a player hits their Strike button, presses their piece and then the targeted piece: the game either rewards a successful attack or punishes a failed strike with an appropriate bit of music. In this way the players never know for certain the rank of the piece that wins the attack, only whether the attack wins, fails, or ties (similar to the role of the referee in the Chinese game of Luzhanqi). Instead of choosing to move a piece, a player can opt to "probe" an opposing piece by hitting the Probe button and pressing down on the enemy piece: the game then beeps out a rough approximation of the strength of that piece. There are no bomb pieces: bombs are set using pegs placed on a touch-sensitive "peg board" that is closed from view prior to the start of the game. Hence, it is possible for a player to have their piece occupying a square with a bomb on it. If an opposing piece lands on the seemingly-empty square, the game plays the sound of an explosion and that piece is removed from play. As in classic Stratego, only a Miner can remove a bomb from play. A player who successfully captures the opposing Flag is rewarded with a triumphant bit of music from the 1812 Overture. Official Modern Version: Also known as Stratego Original. Redesigned pieces and game art. The pieces now use stickers attached to new "castle-like" plastic pieces. The stickers must be applied by the player after purchase, though the box does not mention any assembly being required. Ranking order is reversed to adopt European play style (higher numbers equals higher rank). Science Fiction Version: Jumbo / Spin Master version of Stratego, Common in North America department stores. The game has a futuristic science fiction theme. Played on a smaller 8x10 board, with 30 pieces per player. Unique spotter unit is one of the pieces. Nostalgia Game Series Edition: Traditional stamped plastic pieces, although the metallic paint is dull and less reflective than some older versions, and the pieces are not engraved as some previous editions were. Wooden box, traditional board and game art. Library Edition: Hasbro's Library Series puts what appears to be the classic Stratego of the Nostalgia Edition into a compact, book-like design. The box approximates the size of a book and is made to fit in a bookcase in one's library. In this version, the scout may not move and strike in the same turn. Stratego Onyx: Stratego Onyx is sold exclusively by Barnes & Noble. It includes foil stamped wooden game pieces and a raised gameboard with a decorative wooden frame. Franklin Mint Civil War Collector's Edition: The Franklin Mint created a luxury version of Stratego with a Civil War theme and gold and silver plated pieces. Due to a last-minute licensing problem, the set was never officially released and offered for sale. The only remaining copies are those sent to the company's retail stores for display. Ultimate Stratego: No longer in production, this version can still be found at some online stores and specialty gaming stores. This version is a variant of traditional Stratego and can accommodate up to 4 players simultaneously. The Ultimate Stratego board game contained four different Stratego versions: "Ultimate Lightning", "Alliance Campaign", "Alliance Lightning" and "Ultimate Campaign". Stratego CD-ROM: No longer in production, this version can still be found in many online stores. Produced by Hasbro Interactive this game combined Classic and Ultimate Stratego to give a choice of five different versions. Stratego Waterloo: For the bicentenary of the Battle of Waterloo in June 2015, the Dutch publishing group Jumbo published Stratego Waterloo. Instead of using ranks, the different historical units that had actually fought at the battle were added as pawns (Old Guard, 95th Rifles...) - each with their own strengths and weaknesses. The pawns are divided into light infantry, line infantry, light cavalry, heavy cavalry, artillery, commanders and commanders in chief (Wellington and Napoleon). Instead of capturing the flag, the players must get two of their pawns on the lines of communication of their opponent. Hertog Jan, a Dutch brand of beer, released a promotional version of Stratego with variant rules. It includes substantially fewer pieces, including only one Bomb and no Miners. Since each side has only about 18 pieces, the pieces are far more mobile. The scout in this version is allowed to move three squares in any combination of directions (including L-shapes) and there is a new piece called the archer, which is defeated by anything, but can defeat any piece other than the Bomb by shooting it from a two-square distance, in direct orthogonal, or straight, directions only. If one player is unable to move any more of his pieces, the game results in a tie because neither player's flag was captured. These variants are produced by the company with pop culture themed pieces. Stratego is a very competitive game and this competition has increased over the years. There are now many Stratego competitions held throughout the world. Competitive Stratego competitions are now held in all four versions of the game. Competitions in the original game include the "Classic Stratego World Championships", the "Classic Stratego Olympiad" and several National Championships from various different countries. Competitions in this version include the "Ultimate Lightning World Championships" and the "Ultimate Lightning European Championships". Competitions in this version now include the "Stratego Duel World Championships," which were held for the first time in August 2009 (Sheffield,England). To force decisions in knock-out stages in tournaments, in 1992 Stratego Barrage was developed by Marc Perriëns and Roel Eefting. In this "Quick-Stratego" a setup can be made in one minute and played in 5 minutes. The eight pieces with which Barrage is played are the Flag, the Marshall, the General, 1 Bomb, 1 Miner, 2 Scouts and the Spy. Since 1992 Dutch Championships and since 2000 World Championships in Barrage have been organised. Cambodian Champion is Sor Samedy, Dutch Champion (2014) is Ruben van de Bilt, World Champion (2013) is Tim Slagboom. 1991 First Dutch Championship. In 1991 the first Dutch Stratego Championship was being organised by Johan van der Wielen, Roel Eefting and Marc Perriëns. Over 100 players participated in this event in Nijmegen. Wim Snelleman was the winner. Several Dutch Championships would follow. 1997 First World Championship. In 1997 the first World Stratego Championship was being organised by the ISK-Foundation (the precursor of the Dutch Stratego Union) as part of the first Mind Sports Olympiad. Peter van Bodegom was the winner. 1997 First Cambodian Championship. In 1997 Cambodia had the scoop to be the first Asian country in which its national Classic Stratego Championship was being organised. Organizer Roel Eefting defeated runner-up Max van Wel. 1998 World Championship. The 1998 World Championships was held in London as part of the second Mind Sports Olympiad and the winner was Luc Adriaansen. 1998 Second Cambodian Championship. In 1998 Roel Eefting surprisingly lost his title to fellow Dutchman Marc Nickel (Derks), who ironically was invited by him on a journey together through Cambodia. 1999 World Championship. The 1999 World Championships was again held in London as part of the third MSO and the winner was J. Van Geffen. 2007 World Championship. The 2007 World Championship was held in Antwerp, Belgium at the Hotel ter Elst from August 10 through 12th. There were 44 participants, including the first ever player from the United States in the World Championships. It was won by Vincent de Boer. 2007 World Team Cup. The World Team cup is played annually at the World Championships. It is a four player event with teams competing for their country. Holland defeated Germany in the 2007 World Team Cup. 2007 Stratego Olympiad. The 2007 Stratego Olympiad was held as part of the list of events within the Mind Sports Olympics. The 2007 event was held near London, England on 25 and 26 August 2007. Roel Eefting won both the event and the World Title on Barrage (Quick-Stratego which is played with 8 pieces). 2007 Stratego World Team Championship. The Stratego World Team Championship is held as part of the events at the Mind Sports Olympics. This event is a three player event with teams competing for their country. Great Britain defeated Holland in the 2007 World Team Championships. 2007 Computer Stratego World Championship. 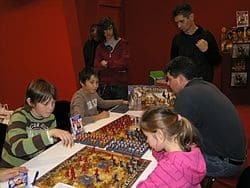 StrategoUSA conducted the first open tournament ever held for Stratego AI programs during December 2007. Programs played Classic Stratego rules in a round robin format. The tournament was a demonstration of state-of-the-art Stratego AI, with the hope it would spur new research into Stratego AI methodology. The winning program was Probe , which finished with a record of 17-0-3 (W-L-D). 2008 Computer Stratego World Championship. The 2008 tournament was held during December with six programs participating. Once again, StrategoUSA hosted the tournament online. Probe repeated as the champion, with a record of 22-3-0 (W-L-D). 2009 Computer Stratego World Championship. The 2009 tournament was held in December. Once again, StrategoUSA hosted the tournament online. The winner was Master of the Flag II, with a record of 30-3-2 (W-L-D). 2010 Stratego World Championship. The 2010 tournament was held in August, in Maastricht, Netherlands, Pim Neimejer (Netherlands) won the World Championship (overall score). Lady Kathryn Whitehorn (England) won the Women's Stratego World Championship. In team play, The Netherlands National Team won Gold (first), Germany Silver (second), and England Bronze (third). 2010 Computer Stratego World Championship. The 2010 tournament was held in December. Once again, StrategoUSA hosted the tournament online. The winner was Probe, with a record of 24-3-3 (W-L-D). Jungle (board game), "Game of Fighting Animals"